Muscle meals for men who are following a bulking diet plan and want to gain muscle mass. To gain muscle mass fast, you need to follow a mass gain diet that has an ideal balance of macronutrients at every muscle building meal. These top 10 muscle gain meals to be included in your bulking diet plan are big on taste and also packed with a variety of muscle building and mass gain proteins, complex carbohydrates and good fats. When you are following a bulking diet plan you know you have to eat several times throughout the day so planning your muscle meals in advance is key to getting mass gain results. Plan ahead by cooking muscle meals that will last for at least a few days and fit perfectly into your mass gain diet. Get plastic containers that are the correct size for your muscle meals so that you can also throw the left overs into a muscle meal container and freeze it for later. 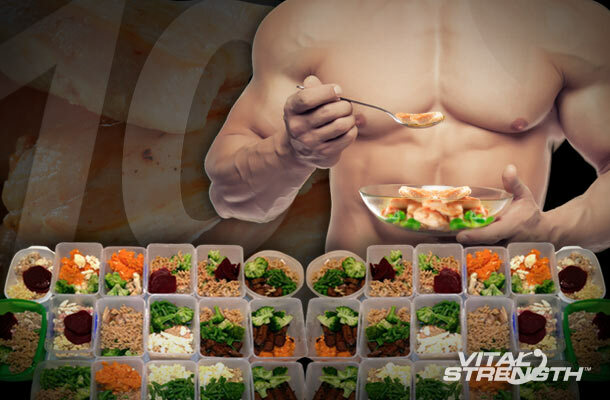 Our motto for mass gain diet and meal plan success is: PREPARE, FREEZE, GROW! 2. Remove and shape into 8 patties. 3. Cook patties in a pan over a low – med heat with olive oil for around 2 mins each side until browned and cooked through. 4. Lightly spread with mayo on toasted burger buns. 5. Top with lettuce, patties and cucumber. 6. Freeze or refrigerate remaining patties. 1. Heat oil in a large wok and stir-fry pork in two batches, until browned. Remove from pan. 2. Stir-fry garlic and ginger for 30 secs. 3. Add capsicum, courgettes and corn and stir-fry for further 1 min. 4. Return pork to wok and stir-fry for a further 1-2 minutes stirring in soy. 5. Serve with brown rice. Freeze or refrigerate left over’s. 1. Preheat oven to 180deg. 2. Heat oil in a frying pan over medium heat and cook onion, broccoli and zucchini until soft. 3. Add spinach and ham. 4. Beat egg whites and combine with cottage cheese and season with a sprinkle of salt and pepper. Arrange green vegetables into an oven dish. 5. Evenly pour over the egg white mix. 6. Bake for 20 – 30 minutes or until set. 7. Serve hot or cold with a green salad.